Updated: Sept. 14, 2012 at 02:12 p.m.
C.J. 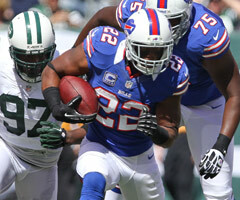 Spiller vs. Kansas City Chiefs: With Fred Jackson out of action, Spiller is now a terrific starter in fantasy land. In his last four games dating back to last season, he's carried the football 55 times for 431 yards (7.8 YPC) and scored three touchdowns on the ground. Spiller has also been effective as a pass catcher with a combined 17 receptions for 168 yards and an additional two trips to the end zone. BenJarvus Green-Ellis vs. Cleveland Browns: The Law Firm sure was impressive in Week 1, posting a rushing touchdown and 15.50 fantasy points against a tough Ravens defense in Week 1. Next on the schedule is a much more favorable matchup against the Browns, who have been weak against the run in recent seasons. While I don't see Green-Ellis as a No. 1 fantasy runner, he is a terrific No. 2 or flex starter this weekend. Jamaal Charles at Buffalo Bills: Charles didn't post a huge stat line in Week 1, but it was good to see him run well and without limitations following major knee reconstruction last season. I see his statistical fortunes improving against the Bills, who have fielded one of the worst run defenses in recent seasons. Just ask Shonn Greene, who rushed for close to 100 yards and one touchdown against them in Week 1. Reggie Bush vs. Oakland Raiders: Bush had a respectable stat line in Miami's opener, totaling 115 scrimmage yards in a blowout loss to the Texans. As the lone viable offensive option on their roster, the USC product is certain to see more than his share of opportunites all season long. Couple a virtual guarantee in touches with a matchup against the Oakland Raiders, and Bush should be considered a nice option. Sleeper alert - Alfred Morris at St. Louis Rams: I'm not going to promise that Morris is going to lead the Redskins in backfield touches this week, because no one can predict the mad scientist that is coach Mike Shanahan. However, it's tough not to like the rookie after his monster performance in last week's win over the New Orleans Saints. Consider Morris a solid flex option against a weak Rams run defense. Shonn Greene at Pittsburgh Steelers: Greene is coming off a solid season opener, so his stock is on the rise. Still, can you trust him as a prominent starter on your fantasy football team? I'm not convinced, and this week's matchup in the Steel City makes Greene a less attractive option. Coming off a loss to the Broncos on Sunday night, Pittsburgh's defense will be fired up in front of its home crowd. Kevin Smith at San Francisco 49ers: I listed Smith in the sleeper section of this column last week, and he responded with 91 scrimmage yards and a pair of touchdowns. Good stuff, right? Of course, but that was against the Rams and not this week's opponent, the San Francisco 49ers. No defense has been tougher against opposing running backs over the last year, making Smith a difficult player to start this week. How long will it really take for Fred Jackson to return? Dr. Neil Ghodadra joins NFL Fantasy LIVE crew to break down Week 1 injuries. Beanie Wells at New England Patriots: Wells, who is coming off knee surgery and battling a sore hamstring, was held to a mere 14 yards on seven carries in last week's win over the Seattle Seahawks. While Ryan Williams wasn't impressive in the contest either, it's pretty obvious that Wells is not 100 percent and is now a serious risk for fantasy football owners. He needs to be on the sidelines if possible. Willis McGahee at Atlanta Falcons: McGahee opened the season on a bad note, scoring a mere 6.4 fantasy points. He also lost a fumble and ended up sharing some carries, including a few in the red zone, to Knowshon Moreno. The Falcons had one of the stingiest run defenses in the league last season, allowing the seventh-fewest fantasy points to running backs in 2011. Keep McGahee on the sidelines if at all possible. Owners beware - Steven Jackson vs. Washington Redskins: It's tough to bench a player of Jackson's caliber, and it's worse when you consider the current state of the running back position. However, he could be in for a tough weekend after the Rams lost two starting offensive linemen (Rodger Saffold, Scott Wells) in their opener. What's more, Jackson has rushed for 80-plus yards just once since last November.